The next day, you're at the mall and you see the Jacket you've been eyeing for a while and surprisingly it's for sale that day for 50 off regular price! Again, you have no cash -- So you whip out your Card and put it on Credit. The same day you bought your new jacket, you just remembered a friends birthday is coming up and since your at the mall... Another credit card swipe! Later that week, you remember to go out to purchase groceries...Might as well use your credit card to save a trip to the bank, right? WRONG! Okay, this example may be a bit extreme, but the point is -- Even the smallest insignificant credit card usage can build up and create a problem...a big problem that can have some long term disadvantages. Remember, I've experienced the same problem. But after learning how to control my debt, and using a few methods and techniques I've discovered, getting and staying out of debt is really easy! And My Methods and Techniques Can Work For You! I promise, whatever bad credit or bad debt your in, can be fixed! Your situation is not unique and your problem is not hopeless! The Biggest Myths When it Comes to Bad Credit! Myth #2 - Canceling credit cards will improve your credit score. Wrong! If you cancel or close a credit card you had for a long time, you're effectively shortening your credit history...It's better to keep your card with an amount of zero to raise your score. Myth #3 - Paying with cash will help increase your credit score. Paying cash is a great way to stay out of debt, but it can hurt your overall credit score. Your score is determined by your credit history, which means having and using credit could be good...if you can control it. Here's How You Can Get Out of Bad Debt and Have a Debt-Free Lifestyle Starting Today! 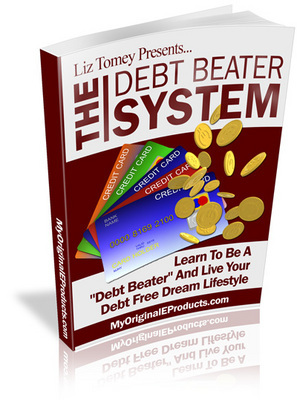 I've just completed my new ebook called, "The Debt Beater System" that gives you a step-by-step system to get out of bad debt! It's way different than anything else on the market and this program took years to develop! Here's a Few Breakthrough Features in my eBook You'll Discover! * What exactly is bad debt or credit and why people get into bad debt. * Steps to avoiding credit card debt, the most common and serious case of debt accumulation. * How to check and choose the best credit interest rate...What to ask and clarify before choosing your credit card with the lowest rates. * Step by step guide to getting rid of your debt in complete detail. * Debt reduction plan to help you pay off all your debts soon than paying only the minimums. * What is interest and how to use the lowest interest rates to your advantage. * Summarizing your debts is very important - I'll show you real life examples of how I summarize my debts correctly and create a formula to pay them all off. * Learn the secret to repaying debts quickly and still save on interest charges...And once that debt is paid off, you can use the secret to pay off the rest of your debt. * Whether your a student, a stay-at-home mother, or working a nine-to-five job, I'll break down step by step how to become debt-free.